So, to help, we’ve complied this list of beautiful venues found across Ohio from the photographer’s perspective—a lot of factors went into consideration for our top dozen, but mainly, we chose places that have tasteful interiors and beautiful, dreamy light for your photos. The country or nature locations have gorgeous outdoor settings like elegantly (and sometimes wildly) landscaped gardens and plenty of shade trees; and for the city lovers, the urban spots have large windows and clean settings with an industrial edge. We chose to start the round-up with Canyon Run Ranch, because out of all the places we’ve photographed in the Dayton area, this one is our favorite. It’s hard to beat the impeccable style of the owners, Amy and Gary Ward. Their home, where brides get ready, features stunning hardwood floors, stain glass windows, stone walls, tasteful antiques, and even a completely glass conservatory. The property is quite large, offering couples multiple options for their ceremony site, including a wooded setting (The Forest Chapel) and a garden location. On the land, you’ll find bubbling brooks, fields of wildflowers, old growth trees, picturesque wetlands and acres and acres of woods. Additionally, the reception barn isn’t your typical Midwest “barn wedding venue.” It still boasts its classic historic beauty like other barns in Ohio, but the owners have added a modern edge, again with their flawless eye for beauty and design. When the sun sets, the already dreamy setting, is magically lit by thousands of twinkling fairy lights. If you love nature, but still have a classy and hip wedding vision, then Canyon Run is worth a visit. The Lake Erie Building is a large, nontraditional space, offering couples a minimal setting to enhance with their own style, creating the wedding they’ve always wanted. White walls, large windows, high ceilings and polished concrete floors make this venue an industrial dream come true. Apart from the actual wedding space, this location also offers outdoor options for rad photos too. One thing we believe that sets The Lake Erie Building apart from other venues is that when rented, according to their website, you have “access to the space for nearly a week, from Wednesday through Monday, so there is no rush to set-up or tear-down, and you'll know the room is ready for your event.” Now that's what we call a stress-free venue! Imagine a place with an elegant, historic home, open space, gardens, small lakes and towering evergreens—That’s Pine Springs Estate in Union, Ohio. The wedding that we photographed here didn’t go as originally planned—a sunny ceremony by the lake—but rather, it down poured for the entire day. However, the property offers plenty of space for large tented ceremonies and receptions, which is exactly what the couple needed. The home welcomes guests with a large front porch that is perfect for taking photos in case of rain, and it has plenty of gorgeous rooms for portraits too. The best part about it raining on this wedding day, was that during the reception the sun finally came out and a gorgeous rainbow appeared. Without the large open areas surrounding the home and lawn, we wouldn’t have been able to see it, let alone get once-in-a-lifetime portraits with it! Pine Springs Estate is still a fairly new venue, so we recommend it to couples who want to do something different than all their friends. The Madison is Cleveland’s best kept secret. As it didn’t officially open for business until 2018, the Madison is still not widely known. 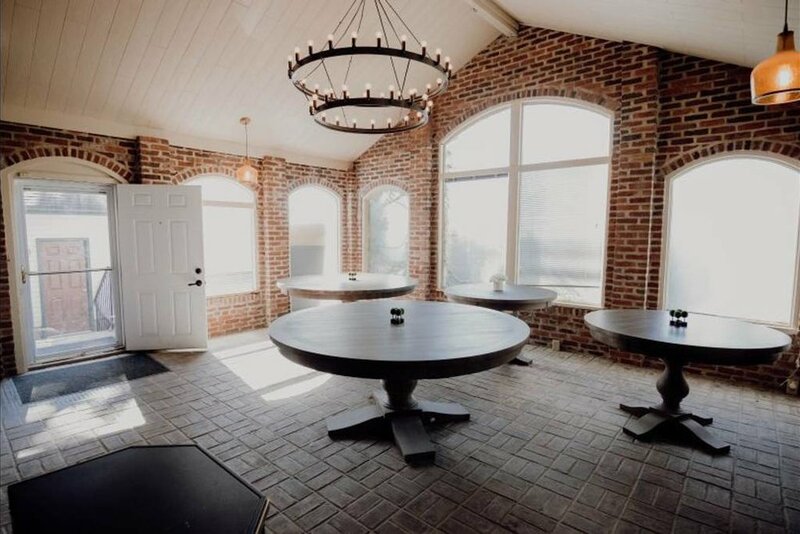 So, if you’re looking for a clean, industrial wedding space, you should jump at the chance to be among the first couples to rock this spot for your nuptials. The owner is a Cleveland-based event professional, and so being in the industry, he thought of everything you could ever need to make your wedding run smoothly, comfortable and in style. There is also a secure private parking lot for your guests’ convenience…Oh and speaking of guests, the Madison has enough space to accommodate more than 500! All-in-all, we believe this venue is worth a tour during your search. Ohioans should take advantage of the fact that our state is home to one of our nations National Parks. Is there really a more beautiful setting than the cathedral of the great outdoors? By having your wedding here, not only are you utilizing the elegant beauty in nature, but you’ll also be supporting and protecting the park for future generations. There are several options for a National Park wedding, but we’ve found Hines Hill of the Conservancy for Cuyahoga Valley National Park to be a splendid choice. Jorgensen Farms new Oak Grove location is a one-of-a-kind wedding venue in central Ohio. Its most alluring feature, and the main reason it’s included in this report, is the magical greenhouse—which can be used for the ceremony and/or reception. The Oak Grove location also offers an open-air courtyard, cottage and a main hall. This serene property features old growth oak trees, a reflective pond, and a lovely garden. Strongwater in Columbus, Ohio, offers couples that on-trend industrial look with more of a vintage vibe. This century old warehouse showcases stunning natural light with its original skylights and large pane windows. The open-duct ceilings and exposed brick walls give the space a cool edginess; and the open-air courtyard adds to its unique character. Since Strongwater also has a restaurant space, they offer multiple bar options with a full liquor license and can cater your wedding with their incredible food. Set in the quiet countryside of Findlay, Ohio, there is a fairly new and enchanting wedding venue called Scarlet Oaks Estate. Surrounded by huge trees and a white picket fence, it’s grand and old, full of character, wood floors and Victorian-style windows that fill the home with rich natural light. The property includes two homes, which is ideal for couples who wish to get ready separately. The historic barn is great for receptions, but couples can also use the front lawn. Because we love it so much, if you’d like to see more of this venue, we featured a wedding here on our blog. A springhouse, flower bordered lawns, rolling hills, historic barn, antiques galore, restored milking parlor, full vegetable garden, and even a greenhouse…the Rural Society at Warwick Farms is eclectic and a bohemian masterpiece. We haven’t found another venue quite like it. If your searching for serenity and whimsy, this may be your place. It’s no secret that Hocking Hills is a paradise for nature lovers in Ohio. Thousands of people visit each year to hike the rolling hills, gorges and river edges. Especially beautiful in autumn, this natural park offers glorious colors—a delectable palette for the eyes. After much research, we’ve found the perfect venue for couples that want to get married here, but are still looking to have the modern conveniences of traditional wedding venues. Set within the Hocking cliffs, Crockett’s Run is a property that provides multiple lodges/cabins and glamping. This venue has enough room to offer overnight accommodations for up to 90 of your guests; golf carts to shuttle, and on-site staff to direct parking and keep things running smoothly throughout all the wedding day shenanigans. At night, there is even a fire pit in the gorge that allows for a bonfire—the whole experience taking you back to your childhood days at camp. The Balsley house is unique in that it’s actually a Dayton Airbnb. The host, Clive, has already helped a couple throw the perfect wedding in this home. Because of it’s size, it’s the ideal setting for an intimate family wedding of thirty people or less. The home features an elegant dining room, a sumptuous parlor, a library room, gourmet kitchen, six bedrooms, four and one half bathrooms, spiral staircases, a sauna, luxurious furniture/fixtures, and most importantly lots and lots of glorious natural light. We know that this isn’t really a venue, but we had to include it in our round-up because backyard weddings are our favorite of all time. The personalization and sentimentality found in having the nuptials in your own space (or that of a family member) can’t be topped. The gathering of your tribe, your people in a place that already means the world to you, will only add to the memories of it. The significance here will mean more to you than anywhere, because there really is no place like home. We hope this list has helped a little during the planning stages, but remember, no matter where you chose to celebrate, it’s all about you and your partner—that’s what is truly making your wedding special, beautiful and memorable. A wedding day is just a commemoration of the rest of your lives together. We wish you the best, always.